The engine on the Ford Edge ST is a twin-turbocharged V6 that can put out 335 horsepower and 380 pound-torque. It’s one of the fastest SUVs in its midsize class, but that’s only the first part. There’s also additional suspension and handling upgrades that make this vehicle even more of an award-winning SUV than the others in its class. 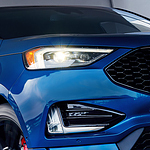 Want to test drive the latest Ford Edge ST? You can find all kinds of models at Courtesy Ford Lincoln.